At my last appointment, my OB told me I was gaining a bit too much weight (35 lbs in 7 mo! ), so I decided to try my hand at prenatal yoga. I really never liked yoga--I was really into Pilates before getting pregnant--but with the intense, lying-flat-on-yourback ab exercises of Pilates a no-no these days, I thought I'd give it another shot. 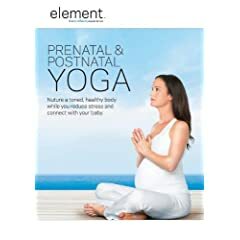 I picked up Element's Prenatal & Postnatal Yoga DVD for $9.99 at Best Buy and its actually not that bad at all. The prenatal program is challenging and a tad long if, like me, you haven't worked out for awhile, but I just paused the DVD when I felt winded and still got a good workout. And while the voice over seemed a bit silly to me sometimes ("breathe in and send your love and hopes to your baby"), the breathing exercises that precede and follow the workout are super relaxing. Who doesn't need to relax these days? There are, however, a few exercises that I skipped being further along in my pregnancy and not having done any ab-strengthening exercises over the last few months. While doing Pilates, the on-hands-and-toes plank position was a favorite of mine, but at 7 months pregnant, I felt like the pressure of the baby was going to tear my stomach muscles. Likewise for the reverse plank except that the pressure of the baby was put on my back and vena cava. Bottom line: While not perfect, this is a pretty good prenatal DVD for the price. And, it has the added benefit of including a postnatal routine too--although I will probably go back to my beloved Pilates! In any case, my next OB appointment is next week so only time will tell if yoga is helping me curb the weight gain. I'll keep you posted! *P.S. I am not a doctor and cannot recommend this DVD medically. Also, no one should attempt a new exercise program without contacting her/his doctor first. Don't hurt yourself!